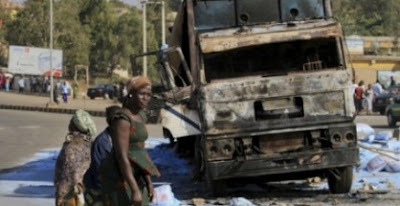 No fewer than 12 persons were allegedly burnt beyond recognition during a fatal motor accident which occurred between Odogbolu and Ososa areas of Ogun State, along Sagamu/ Benin express way on Saturday afternoon. The accident which involved a white Toyota Hiace marked with registration number XA 659D BC and a white truck with registration number LG 35 BBG, left three persons wounded. According to the Public Relations Officer of the Traffic and Road Compliance Agency, in Ogun state, Mr. Adebiyi the accident was caused by over speeding adding that three additional people escaped through the bush. The remains of the victims were said to have been deposited at the Ijebu Ode General Hospital mortuary.